My contribution to a ‘paint-in’ on the Esplanade of Redondo Beach. Another rainy day image from early February. The Los Angeles Times todays lays the blame for all of our nice wet weather (we really need it) on the Madden Julian Oscillation in the tropical Pacific. 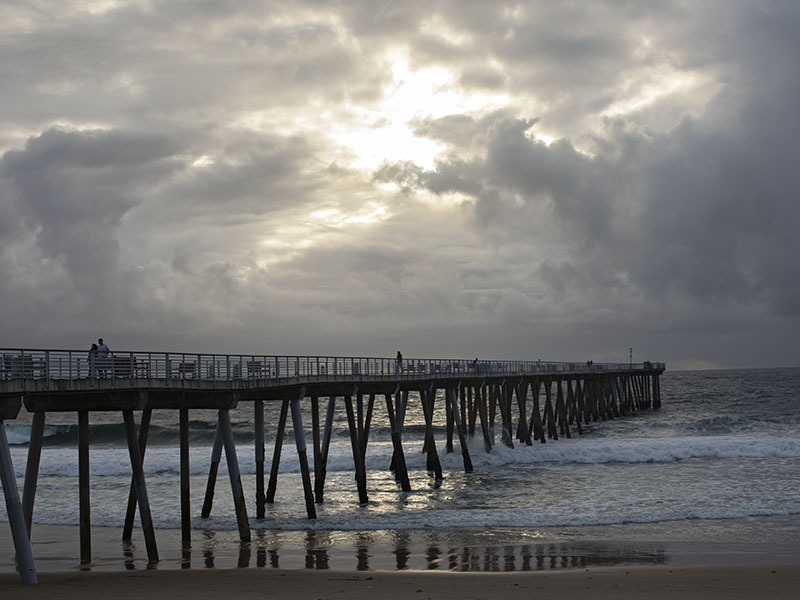 The Hermosa Pier, late afternoon. I was busy experimenting with my aging Canon AE-1 film camera to see if it would run. It does! It does not have the sharpness of a new full frame digital SLR, but it works with no light leaks. I am considering taking it with me as my main camera on a trip this summer when I need something relatively light weight and not expensive. It was bought sometime in the late 1970’s. Rain expected today through the weekend. These giant clusters of tiny yellow flowers appear in January. The high surf levels and winter high tides are moving a lot of sand around. There were only a few surfers in the water around the Hermosa Beach Pier, but for the experts it was a nice morning. The surf was running head-high or over-head, smooth water, and a light mist was falling. This person was just south of the pier. 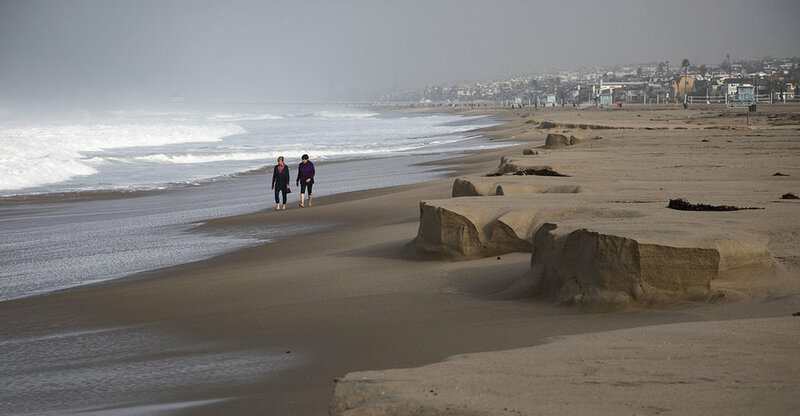 Storms in the North Pacific were driving big swells into the South Bay of Los Angeles. This was the late afternoon view. Many people were out and about, including this group watching the sunset off the Hermosa Beach Pier. They were all looking to the right, but the gull apparently did not find anything of interest in that direction. 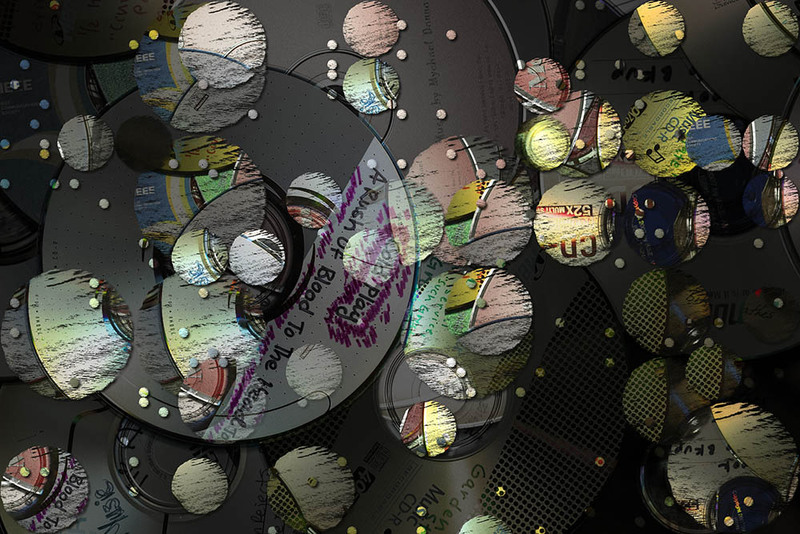 Here is another mosaic experiment, this one starting as a ‘still life’ of CDs. Surf was running 2 to 4 feet late this afternoon. Getting outside was a bit hard, and this surfer was taking a break. This Santa is now swinging merrily from the top of the tree. I visited the Minneapolis Institute of Art on November 21, 2018, and was inspired by a painting by Gabriel Orozco (Untitled, 2016). It was in a gallery featuring “Abstraction from Nature.” My variation on his theme is shown below. To generate this image, I am using my self-written mosaic algorithm in a new way, primarily by changing my library or source images from a duplication of the reference image to a set of diagonal gradients, resulting in tesserae that have triangular patterns within the square each tessera. A mosaic of the Fourth Street C-Train station in Calgary, Alberta. Original image taken on October 18, 2018. We walked over to the Peace Bridge after dinner in Kensington so that I could photograph it at night. It is a popular spot, even on a cool Sunday evening. This bridge over the Bow river is to the east of the pedestrian bridge shown in the 18 October post. Six of us drove up to Banff from Calgary for lunch (bison burgers!!!) and a trip up the Banff gondola to the top of Sulphur Mountain. It was a great trip, and not too cold. The peak is at 7,486’ and there is a wooden raised walkway to an adjacent peak that we took advantage of. Fantastic views! It was also very busy given the very nice weather. We walked into downtown Calgary on a rather nice crisp fall morning. This is a pedestrian bridge over the Bow river.